Have you ever wondered how to program robots to do even the simplest task? Well, it takes a lot of background work, to say the least. But in our LEGO Robotics after-school program, we teach students how to build a LEGO Mindstorm NXT robot from scratch — and how to program it to perform certain tasks. Every Tuesday for 10 weeks, students learn basic programming, and they use that programming to solve weekly challenges. The challenges increase in difficulty as the students become more familiar with the programming and their robots. 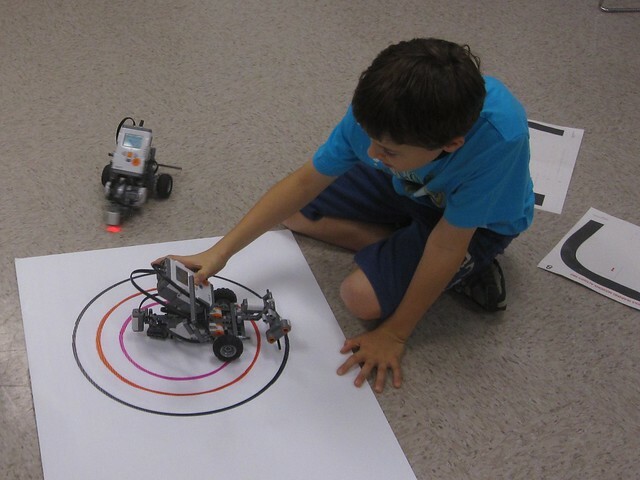 By week 10, students know how to program their robots to reverse, make turns and maneuver in a square formation. In addition, students will learn how to work with different types of sensors that can be attached to the robot, including the ultrasonic sensor. When students learn how to program using the ultrasonic sensor, their robot can navigate through a specified course without running into a single obstacle! The classes are open to children in grades 4 through 7, and they’re held at both the main HMNS location and the HMNS at Sugar Land. If you are looking for an educational after-school program, look no further than LEGO Robotics! Ready to get a piece of the fun? Register here! Next Post Are you ready for this? Public registration for Xplorations Summer Camp begins Monday!